The Coronet was developed to satisfy the connoisseur collector who requires a cabinet of dateless style able to grace and enhance any room setting. Built to the highest standards the case is fabricated to house 30 coin trays together with two small oddment drawers and one full width deep drawer for storing proof or similar cased sets. 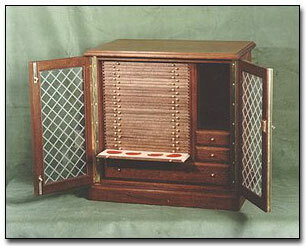 Storage space is also provided for catalogues or reference works. The Coronet's polished top has a ovolo moulding which is matched and echoed by the moulded plinth. The two panelled doors are glazed with latticed etched clear shatterproof Perspex, or as an option you mat specify polished solid mahogany panels. Brass fittings and fitments are used throughout. The trays are available in our full range of recess sizes.